Marc talks about what happened on this day in history, including the day President George Washington invoked the Militia Acts of 1792 to suppress the Whiskey Rebellion in western Pennsylvania, the day in 1960 Black and white students staged kneel-in demonstrations in Atlanta churches, and the day Simón Bolívar triumphed over Spain in the Battle of Boyacá. 1461 – The Ming Dynasty Chinese military general Cao Qin stages a coup against the Tianshun Emperor. 1679 – The brigantine Le Griffon, commissioned by René-Robert Cavelier, Sieur de La Salle, is towed to the south-eastern end of the Niagara River, to become the first ship to sail the upper Great Lakes of North America. 1782 – George Washington orders the creation of the Badge of Military Merit to honor soldiers wounded in battle. It is later renamed to the more poetic Purple Heart. 1789 – The United States Department of War is established. 1791 – American troops destroy the Miami town of Kenapacomaqua near the site of present-day Logansport, Indiana in the Northwest Indian War. 1794 – U.S. President George Washington invokes the Militia Acts of 1792 to suppress the Whiskey Rebellion in western Pennsylvania. 1819 – Simón Bolívar triumphs over Spain in the Battle of Boyacá. 1927 – The Peace Bridge opens between Fort Erie, Ontario and Buffalo, New York. 1930 – The last confirmed lynching of blacks in the Northern United States occurs in Marion, Indiana. Two men, Thomas Shipp and Abram Smith, are killed. 1933 – The Simele massacre: The Iraqi government slaughters over 3,000 Assyrians in the village of Simele. The day becomes known as Assyrian Martyrs Day. 1940 – World War II: Alsace-Lorraine is annexed by the Third Reich. 1944 – IBM dedicates the first program-controlled calculator, the Automatic Sequence Controlled Calculator (known best as the Harvard Mark I). 1954 – Charles H. Mahoney was confirmed by the Senate and became the first Black to serve as a full delegate to the United Nations. 1960 – Côte d’Ivoire becomes independent from France. 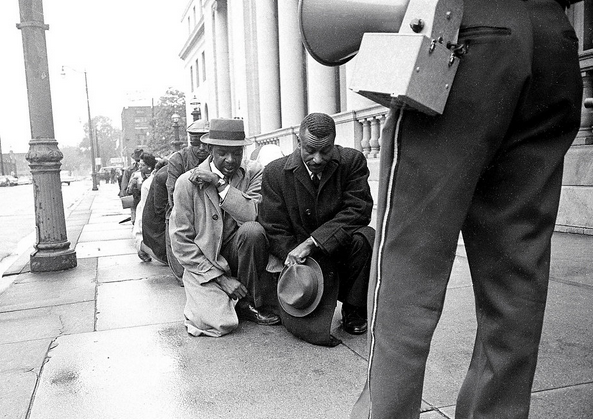 1960 – Black and white students staged kneel-in demonstrations in Atlanta churches. 1964 – Vietnam War: the U.S. Congress passes the Gulf of Tonkin Resolution giving U.S. President Lyndon B. Johnson broad war powers to deal with North Vietnamese attacks on American forces. 1965 – The infamous first Reyes party between Ken Kesey’s Merry Pranksters and motorcycle gang the Hells Angels takes place at Kesey’s estate in La Honda, California introducing psychedelics to the gang world and forever linking the hippie movement to the Hell’s Angels. 1966 – Race riots occur in Lansing, Michigan. 1970 – California judge Harold Haley is taken hostage in his courtroom and killed during an effort to free George Jackson from police custody. 1970 – Angela Davis who was implicated in a shootout during an attempted escape in a San Rafael, California, courthouse, went into hiding to avoid arrest. Davis was acquitted of all charges on June 4, 1972. 1978 – U.S. President Jimmy Carter declares a federal emergency at Love Canal due to toxic waste that had been negligently disposed of. 1998 – The United States embassy bombings in Dar es Salaam, Tanzania and Nairobi, Kenya kill approximately 212 people. 1999 – The Chechnya-based Islamic International Brigade invades the neighboring Russian Dagestan. 2007 – Barry Bonds of the San Francisco Giants breaks baseball great Hank Aaron’s record by hitting his 756th home run. 2008 – Georgia launches a large-scale military offensive against South Ossetia, in an attempt to reclaim the territory from Russia, starting the 2008 South Ossetia war. 2012 – Three gunmen kill 19 people in a church near Okene, Nigeria. 1970 – Jonathan P. Jackson, American bodyguard (b. 1953) Jonathan Peter Jackson (May 1953 – August 7, 1970) is primarily known for initiating an attempt to negotiate the freedom of the Soledad Brothers (including his older brother George) through the kidnapping of Superior Court judge Harold Haley from the Marin County Civic Center in San Rafael, California, an incident in which he was one of four people killed.